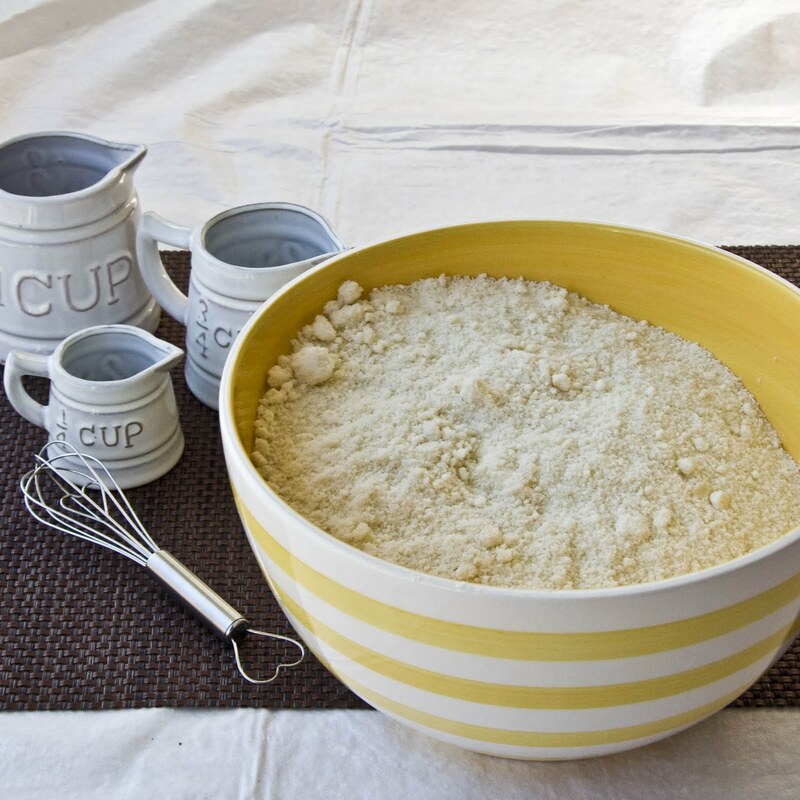 Kneady Sweetie: Homemade Yellow Cake Mix And A Winner! First things first I am going to announce the winner of the giveaway! The lucky winner of When Life Gives You Kids from Lemon Poppy Cakes is Shirin Rose over at Diary of a Messy Kitchen. I will email you shortly to finalize all the details! I love making things from scratch. It is one of the things I love most about this blog and baking. I love finding something that I usually would buy from the store and making it from things I have in my house. I feel that it is healthier, more fun, and usually tastes better. This cake mix is no different. This cake mix could be accredited for the beginning of my food blog escapades. My sister in law told me that there was this site that had a recipe for a homemade cake mix. I thought this was the most wonderful idea ever. She gave me the link to Mel's Kitchen Cafe and I fell in love. I fell in love with the recipe, with food blogs, and with all things foodie. I started following several food blogs and loved all the different recipe ideas. I love that I can go to the internet and find a recipe for just about anything I want to make. It really is amazing and this recipe is the one that could have started it all. Now back to the recipe. I really do love this recipe. Not only is it great as a cake, but what I really use it for most is for crisps or any dessert that calls for a yellow cake mix. The flavor is so much better (notice I didn't mention anything about healthier). I do love this cake mix and love that I can keep it in my freezer and use it whenever I need it. I hope you enjoy it as much as I do! *Note: the recipe calls for cake flour, which I never have on hand so I substituted 2 3/4 cups plus 1 tablespoon all-purpose flour and 3 tablespoons cornstarch for the three cups of flour called for in the recipe. It worked beautifully. Process sugar, flours (or flour and cornstarch if making the substitution for the cake flour), milk powder, baking powder, and salt in a food processor for 15 seconds to combine. Add butter and vanilla and pulse until the mixture resembles coarse meal (you want this much finer than, say, a pie crust). Freeze the dry mixture in a zipper-lock bag for up to 2 months or use immediately. To make the cake, adjust an oven rack to the middle position and preheat the oven to 350 degrees. Grease and flour your pan of choice (see the note above the recipe). With an electric mixer, beat the prepared cake mix, 1 1/4 cups warm water and 2 large room-temperature eggs until the mixture is smooth, about 2 minutes. Scrape the batter into the prepared cake pan(s) and bake until a toothpick inserted in the center comes out clean, about 25-27 minutes for two 9-inch layer cakes. See the note above the recipe for alternate cooking times with other baking pans. Cool the cake(s) in pan(s) for 10 minutes, then turn out onto a wire rack. Cool completely. Yay!! Thanks for hosting a great giveaway! I love the blog! I love your measuring cups! Love the idea if homemade cake mix!! Thanks for sharing!! This is a great idea to have on hand in the freezer whenever you want. Thanks for sharing! Congrats to the winner. I like the measuring cups. This is perfect. There are so many good looking recipes that call for a boxed cake mix and, like you, I prefer making that kind of thing from scratch. This is definitely a winner and there will be no need for freezing; it'll be used immediately around here! I am not a cake box user but I love this idea. I know it is fresh and what the ingredient actually are. Great gift idea. Thanks. Great idea to substitute this for a box mix...I'm not a fan of the artificial flavor of these. YUM!